To make this dish, you’ll need to whip up a batch of my Harissa Cashew Cream. Good news though, only about half of the recipe is needed to make the cauliflower dish so you’ll have plenty left over to use in your kitchen. 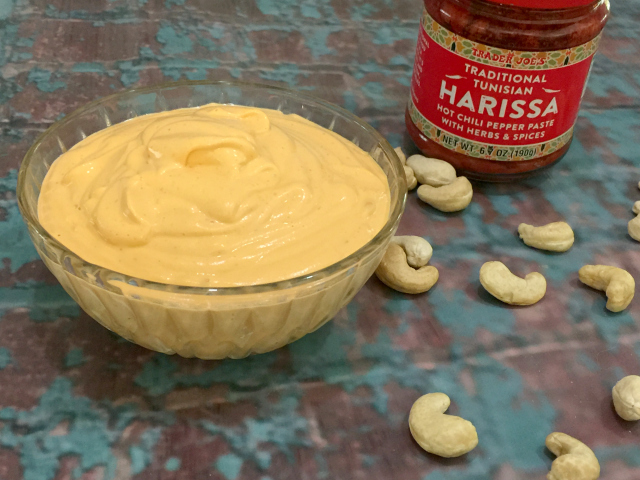 I’m a long-time fan of cashew cream, I make sriracha cashew cream often, but there’s a new cashew cream in these here parts, Harissa Cashew Cream. Eating it on everything right now. You’ll want to as well, I just know it! About roasting cauliflower: you’ll notice in the recipe there is a wide range of cooking time. Some of you will prefer your cauliflower cooked just until it is soft. Some of you, like me, want to cook your cauliflower until it is charred and has lots of color on it. This is completely up to you. 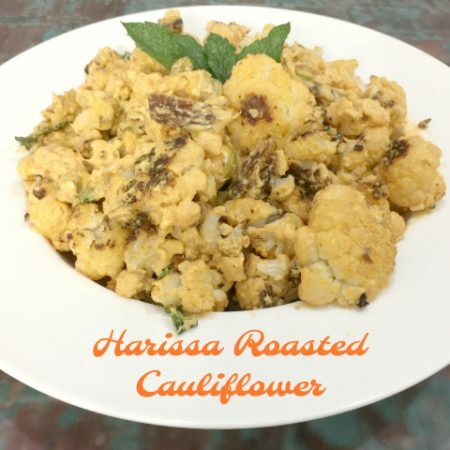 The same goes with the amount of Harissa Cashew Cream you toss the roasted cauliflower in; toss with just a little to add just a bit a flavor or toss with a lot for a super creamy dish. 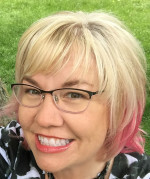 Any way you go about it, I hope you enjoy it! Preheat oven to 450 degrees. Line baking sheet with parchment. 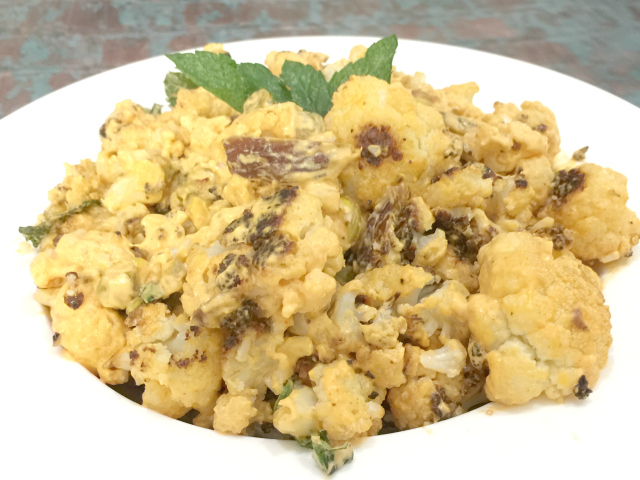 Toss cauliflower florets in oil of your choice and place on baking sheet. Bake for 25-35 minutes until desired level of color is achieved. While cauliflower is roasting, shell and roughly chop pistachios. Cut dates into slivers. Add these both to the bowl you used to toss the cauliflower in oil. Add most of the mint leaves to the bowl, reserving a few for garnish. When cauliflower is done roasting, add it to the bowl. Add about 1/4 cup of the Harissa Cashew Cream and toss gently. If you like the dish a bit more creamy, add more sauce a Tablespoon or two at a time. Serve immediately. Garnish with a few reserved mint leaves. How many pistachio nuts would you add to this dish?